Time for a little tutorial eh? Let’s make a Photo Gallery – one that is a combination of already made scripts and plugins; one that is loaded automatically; and of course – one that looks awesome. We are using PHP, FancyBox jQuery plugin and TimThumb. Important: You should use the latest version of TimThumb due to vulnerability issues with old code. Make sure you keep updated to keep your site secure. Images – this is where the image of the gallery will go. Download Timthumb script: http://www.darrenhoyt.com/2008/04/02/timthumb-php-script-released/. Timthumb is an image resizer script that is written in PHP. Save timthumb.php inside scripts. This loops through each item in the array $files – and assign it to another variable $file. For each one found, we’re printing a list item with an anchor and image tags. Within these tags you’ll notice the variables we’ve created earlier. 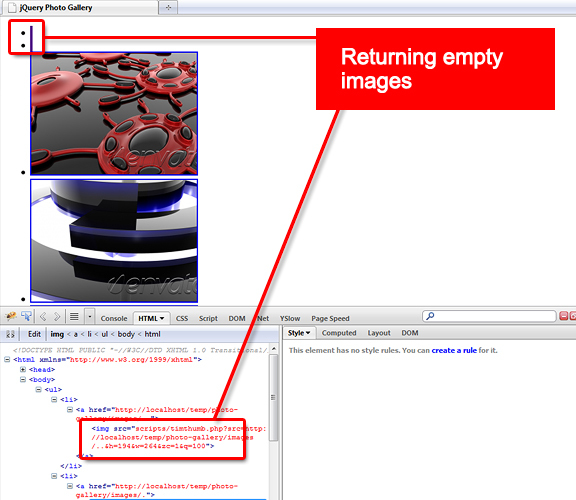 The timthumb script is inserted at the beginning of the src attribute of our thumbnails. The width and the height parameters are hard coded in there as well. Note that we are going to randomize this section a little bit later. Now let’s add a “rel” attribute to our anchor tag, with a value of “lightbox”. This makes it easier for our script to target which elements to add an effect on. The above code states that when the document is ready – grab all the anchor tags with an attribute value of “lightbox” and hook it up with the fancybox function. I’ve chosen the effect ‘Elastic’ for the transitions – you can replace this with your own liking. Now go back to the browser and hit F5 to refresh. 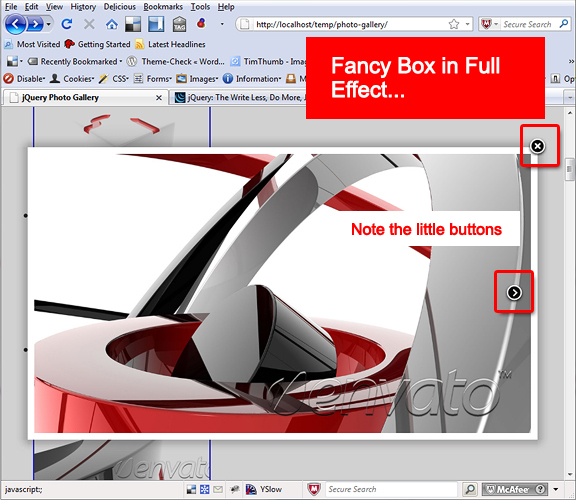 Click on a thumbnail – you should see Fancy Box in action with smooth and eye popping animation added to your photo gallery. Next up – some styling with CSS. Now it is always good practice to separate your formatting and markup. Create a new file named style.css, go back to index.php and link the stylesheet we just created. The above styles adds the subtle details that will make our thumbnails beautiful. 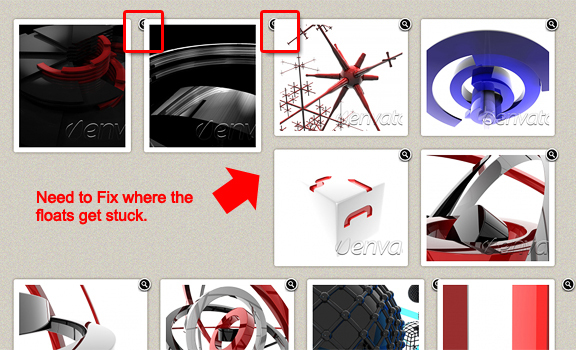 This includes – of course our magnify.png, CSS3 box shadows (box-shadow) and rounded corners (border-radius). Our gallery looks really good so far, but not good enough. Let’s add some embellishments. Now our thumbnails have different orientation each time we refresh. But as you can see, we need to fix the float – some thumbnails get stuck where portrait ends. We also need to fix the magnify icon positioning. The above code overrides the default styling for the list items. Note that you also have to delete some previous styling for our list items (see the comments in the download). If you’re following this tutorial – I apologize for the replacements. As you see, I’m developing this as I go. Finally, download the fancy box mousewheel.js pack inside your scripts folder and include it in your document. You should now be able to view next and previous images once you scroll your mouse wheel. Can I add Disqus to each picture? i’ve been looking at how to create a photo gallery for ages via php and this is the best one i’ve come across! the only problem is when i try to view the sample to test it via easyphp it doesn’t work, just shows the loading part… no images are actually shown, any help please? cheers! Try to fix this site for my dad, but it doesnt work well. Can someone please check this out? I need a photo gallery and it seems that this is a good solution. I suppose the *.js scripts arent loading well? I would like to have a gallery with the same image order all the time, so i removed the randomization code. The problem is my images aren’t all the same size, and i would like to have tall and wide pictures, according to the origional picture size. Is there a way to recognize the ratio of a picture, and then giving it either a tall, or a wide picture frame based on the ratio? I am trying to use your system. I can get the thumbnails to appear, but when I try to use the latest versions of jquery and fancybox, the effects are not showing up (nothing changes). I am using jquery-1.7.1.min.js and fancybox v. 1.3.4. I have followed your instructions exactly, and yet it is not working. Also, when I include the extra rel=”lightbox” in the path name, the thumbnails show up, but when clicked the pictures do not citing an error. This still does not make the fancybox effects appear. Please help me if you can. Thank you. Correction…it works in Firefox fine, but does not work in Chrome? Do you have any idea why this is? Ok, for some reason it wasn’t working, now it is. But certain pictures won’t have thumbnail pictures appear, even with the if statement included. They are regular .jpg images (although quite large). Is there a size limit with this system and a way to change it? but i have a problem with the thumbnails… they are not apear. but when i click on them it leads me to the original photo.. what should i do?? hi ..i am try to add this in wordpress theme .. but problem is the zoom icon in widget .. can you help me ..
the zoom icon – you might want to use firebug to inspect the html. it will help you out. Please help me! What can I have made wrong, I have study php, mysql and html in at least 3 years but I don’t get my images to show up at the first step. I need your help very much this is the best gallery on the web that you learn out! I love your tutorial but what can I have made wrong?? Please help! File and folder permissions should be set on 777 (read-write-execute for everyone) for cache directory and its content. I had the same problem before on localhost. However when I uploaded the code on the web server I had no problem with the permission. You can change permissions when cache directory is created. Go to mkdir(cache) (or something like that) in timthumb.php and you can change it like this mkdir(cache,0777). I put the 0 in front because the mode should be in octal. Or just use chmod. Hope this works for you. now I kinda solved my problem.. if I echo out $path i get the right url but it shows destroyed images.. If I click on them it does work. What have I done wrong?? Great tutorial, working great, thanks. But wondering how to make the magnifying glass icon a link to the zoom view? yes. you can add an anchor tag inside that empty span – with href to the larger image. Is there a way to create thumbnails for sub folders? Im looking to incorporate what Len created but with thumbnails with text vs just text or just the thumbnail. I have thought about my issue so much that my brain hurts, i can’t figure out what i am doing wrong. Im still at step one. It lists all my pictures as broken thumbnails, but when i click on them it opens op the pictures. $path = ‘http://’ . $_SERVER[‘SERVER_NAME’], do i have to alter something here? or does ‘http’ and [server_name] just have to stay unaltered? It might be something else, but i have no clue to what it could be. do an echo $path and see if if looks like your web server url. i.e. if its http://localhost/ etc. Im sorry, but i need a little more elaboration than that. Im a real beginner when it comes to PHP. Yet another obstacle occurs! 🙁 Hopefully the last related to creating this php gallery. For some reason the fancybox script is not working, and I’m pretty sure that the code is correct, and I’m also doubting that permission is what causing the problem. This is the destination where my scripts are located and are named. Any coiners as to what i am doing wrong? make sure the scripts are being included in the page. Scratch that. After hours of checking, rechecking and double checking i finally got it to work! This time i honestly don’t know how i fixed it. All of a sudden istead of images opening in another window, they opened up in the bottom of the page. From there i figured out another problem, i had placed the fancybox css in a wrong folder. Once i put the css file in the right place, everything just worked. But i am very curious as to how i solved the first problem! This is a tough guide for someone who never done any php coding. I got as far as to create a root, image and a scripts folder. However my pictures show up as broken, which makes me assume i have done something wrong in the first steps, but i can’t figure out what. Also there appears to be more images than i have in my folder. I also can’t figure out what document to include jQuery in. I think if i had more knowledge on Php this would be a easy guide. If the image folder contains a subfolder, the script scans it as it was an image and it displays it as a broken image link. How can I exclude subfolders from scanning? Wow now thats WORK, thanks for the pointers. This thing is awesome! I connected it to my database and using string variables in the paths I can launch seperate galleries by user id (much like FB & Flicker do). I’m working on a good up-loader and user script for this. It’s just what I needed for a new project I am working on. Have you considered pagination? some of my folders are pretty big. On one host it works perfect but timthumb flops on the other even with the latest version. Haven’t figured that one out but it’s working great on the other. I can’t wait to get the rest of my app set up. Thanks for a really useful script. Hi Len, please share version of what you made out of this tutorial or at least some pointers. Ok so I took this and ran with it. in the end I changed a lot of stuff but this tutorial inspired me. First thing is that I have a lot of photos so i either had to have a lot of folders or go another way. What I did is set up a database with two tables, one for images and another for categories. Then replaced the Tim thumb script and used the gd libraries re-size functions. I upload my images and they are sized exactly as in the tim thumb, as well as a 900px max width or height version and the original. So I have 3 images for each photo. My up-loader renames them all so I never worry about overwrites. Then using the “get” function I call the modified page from here and there it is. I did away with the randomization because I have pagination that shows 20 images at a time in order. This turned out extremely well and was the result of no less than 4 tutorials and two weeks work. I still haven’t cleaned up the code well enough to suit me but it is working without any issues. Thanks for a great tutorial. Hi, can you describe how to disable randomization? you should skip the section to randomize the sizes and the order. Hello, thanks for that good work. I just have a little prob : when I click the thumbnails I have this message “The requested content cannot be loaded. I stay blind… sorry for my english and thank you for your response. Thank you so much! I’ve been trying to teach myself “just enough php” to do just this, with the customary ensuing frustration—With this you’ve zoomed my project ahead lightyears in one short evening! I will repost the site url once it’s done. Again, many thanks! it looks like you got it. awesome gallery. and thanks for this wonderful tutorial! I wonder how you can make this into a web page containging multiple galleries. I’m a complete noob when it comes to web pages, can you please gice me a hint? multiple galleries – just duplicate the pages, have scandir() in a separate directory. 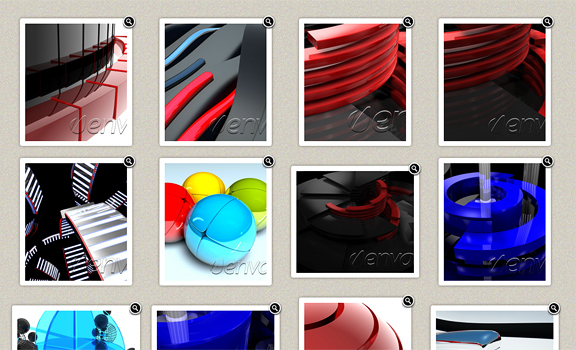 How do we incorporate this gallery into a WP site and/or do any of your wp site have this? Great tut after a long while 🙂 . looking forward to see more tuts ! Wow, my head is swimming after this one! One question I have is in regards to the magnifying glass icon. I kept wanting to click it but it’s just there for show it seems. This is on Chrome v. 10.x BTW. Is that intended behaviour for the icon? yes its just for show.